Yes, you CAN sing in German! As a singer, diction can be one of the hardest skills. Christine, founder and director of GVAI, asked coach and diction expert Ellen Rissinger about how to approach a song in a foreign language and how to enjoy the process. Ellen Rissinger is an American Vocal Coach/Accompanist on the music staff of the Sächsische Staatsoper (Semperoper) in Dresden, Germany. She started her career in the United States working with companies such as the Opera Company of Philadelphia, Pittsburgh Opera, Kentucky Opera, Glimmerglass Opera, Baltimore Opera, Knoxville Opera, Opera Theater of Pittsburgh. She was music director of Glimmerglass Opera's 25th Anniversary tour and of Opera Iowa and was on the faculty of Carnegie Mellon University for several years. In 2003, Ellen moved to Germany, where she has since worked at the Semperoper, Oper Frankfurt, Deutsche Oper am Rhein, Stadttheater Pforzheim, Mainfranken Theater Würzburg. In 2013 she worked with Bregenz Opera Festival on the World Premiere of Andre Tschaikovsky's The Merchant of Venice. Since 2005 she has been a much-sought-after master teacher with many of the summer music programs in Europe and she joined GVAI's summer opera program in Seattle, WA three years ago. Christine: You are the co-founder of The Diction Police. Tell us a bit more about it. How you got the idea to start this service for singers? Ellen: About a decade ago, I had several teachers and coaches in the United States asking me what books they should be using for lyric diction—and then suggesting to me that I should write a diction book. But for me, the limitation of books is that we don’t really get to hear the sounds! In lyric diction, we use the same letters across the languages, but there are subtle differences between, say, a closed vowel in Italian (“sera”) and closed vowel in German (“Seele”). Plus, as much as I love to read, I’m a very aural learner, so I started looking for a way to bring the sounds of the languages alive for singers. For years I’d been a huge fan of podcasts to study languages, so it seemed the logical next step to create a podcast where singers could hear the languages spoken by native speakers who are in the opera world, and hear what they have to say about singing in their own languages. 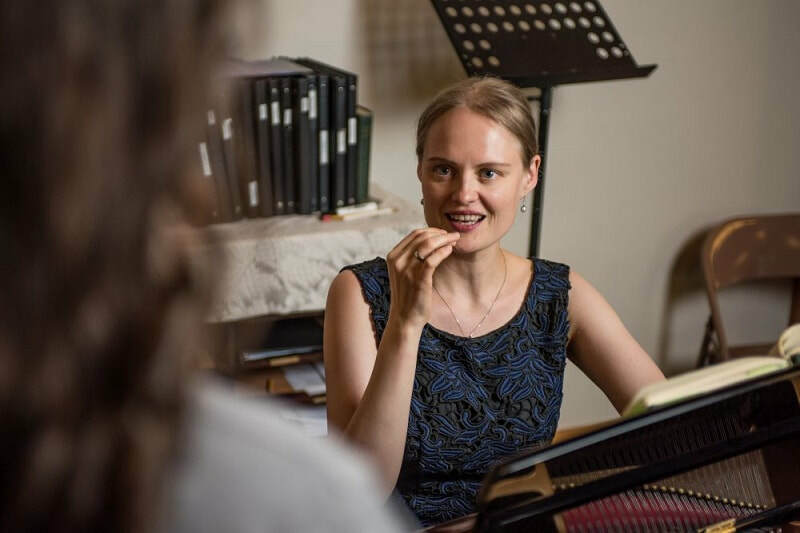 Christine: In my work as a German diction coach, I find that young singers at the beginning of their studies are not aware of the importance of diction and storytelling in their singing and what impact it can have on their career. On the other hand emerging singers and young professionals book regularly in person or online coaching with me to prepare for roles and auditions. What is your experience and why do you think diction is important? Ellen: I agree that young singers are often unaware of the importance of lyric diction—partly because they don’t understand how it relates to singing. No one ever seems to talk about how to connect what we learn in diction class to the vocalises that voice teachers do at the beginning of a lesson, much less to the texts in our songs. I’m a big advocate of making sure to remind singers of the rules, and then showing them how to apply those rules to their singing, even their warm-ups. My favorite question is: “What vowel are you trying to sing?”, just to make singers aware of the sounds they are making. Christine: As a coach at the Semper Opera in Dresden/Germany, you work with international singers all the time. What are the challenges most foreign singers experience with German diction and how do you help them? Ellen: In general, we all come at a foreign language from our own native language, so each country will have their own problems learning German diction, depending on the rules of their own language. For English-speakers, we have a tough time with “Auslautverhärtung” (hardening the final consonant) when it occurs after voiced consonants like L or N--for example, saying a real [s] sound after the ‘n’ in “vergebens”, because in English that would be a [z] as in “kittens”. When I make corrections, I also remind singers of the rules, so that they can work their way through a new word on their own. And if the word is an exception, I make sure to let them know that, so that they don’t apply the wrong rules somewhere else in the language. 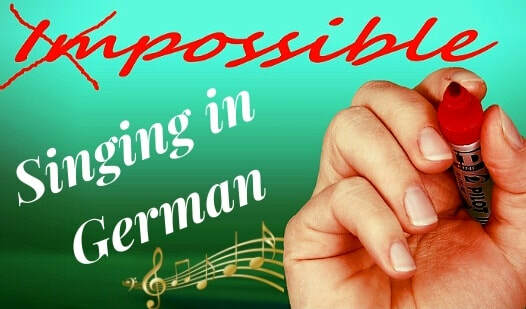 Christine: How do you suggest singers might approach a new song or aria in German? Ellen: I have a very strict regimen that I apply to every aria/song/opera. Prima la parola!! Basically it boils down to separating out the different parts of singing, text/pitches/rhythm, and working on them each alone, then piecing it together in different configurations. Oftentimes, people just want to sight-read and start singing, and that is actually one of the slowest methods to learn anything—breaking things apart gives you the time to look at each component and learn it correctly, whereas putting everything together all at once means you’re likely to overlook a component. Christine: Are there websites/books/resources you recommend? Ellen: Obviously I would recommend a subscription to The Diction Police! We have PDFs with translations and phonetic transcripts, as well as text readings by native speakers, full-length diction courses, Diction Lessons where we highlight a rule of lyric diction by including video clips with examples, Diction Tips where we focus specifically on one point of lyric diction and show examples, tongue twisters for singers with fun texts to turn your tongue inside out. As for books—my go-to resource is David Adams’ A Handbook of Diction for Singers, which has a rather comprehensive look at the rules of Italian, French and German. Jason Nedecky also has the excellent French Diction for Singers, which a list of over 7,000 proper names and places and their phonetic transcription, of words from the standard repertoire. Of the specialty languages, Timothy Cheek’s Singing in Czech, Lydía Zervanos’ Singing in Greek, and Anna Hersey’s Scandinavian Song are all books I would highly recommend. Christine: The internet offers us unlimited audio and video material of singers from all over the world. What are your favorite German singers that young singers can learn from? Ellen: My list of people to listen to nowadays would include Christoph Pohl, Georg Zeppenfeld, Rene Pape, Jonas Kaufmann, Christa Mayer, Diana Damrau, Manuela Uhl. For old school singers, I love Peter Schreier, Theo Adam, Kurt Moll, Christa Ludwig, Rita Streich, Anneliese Rotherberger. Christine: Language is always evolving; performance practice and taste changes. In my coaching singers sometimes wonder when I advise them to change their rolled R's at the end of words and they refer to a Fritz Wunderlich recording that they found on Youtube. What is your opinion about that? Ellen: My answer to that is exactly what you said—performance practice is always changing. Nowadays, rolling the Rs at the ends of words usually feels very old-fashioned, especially in intimate Lieder texts. My one caveat to that is Wagner—for some reason, the Wagner repertoire still tends to get more rolled Rs throughout than in any other style, so when you hear the rolled Rs that Jonas Kaufmann sings in everything, remember that he sings a lot of Wagner! Christine: What are the differences between speaking and singing in German? How do you approach vowel modification when the range changes? Ellen: Spoken German, just like spoken English, has a few sounds that can be swallowed or softened. In the same way that we swallow drop off syllables, that can happen in German—in fact, in Duden Aussprachewörterbuch, many schwa syllables are completely dropped in the IPA. As for softening—in English, medial ‘t’ can become a [d] sound, as in “later”, rather than a full [t]. This can also happen in German at the end of a consonant cluster like Stunde, where the ‘t’ ends up becoming almost a [d]. All of these sounds in lyric diction should maintain their ACTUAL phonetic sound. When it comes to vowel modification, I think my biggest concern is that many people think “modification” means “sing [a]”. That’s not what it means at all. Modifying a vowel is a very specific tool to make things ring better in certain parts of the voice, and often the closer we remain to the original vowel, the better. For example, if the high note is on [i], try singing [y]. If it’s a form of [e] or [o], try [œ] or [ø]. Many times, the combination of a fronting vowel with some lip-rounding is a great solution for high notes, rather than simply trying to sing [a]. Christine: You’ve been working in Germany now for 16 years. What is your personal success recipe of first getting an excellent German diction and then also German fluency? Ellen: I started with a good basis in the diction, and apply it to each new word I learn, even now. Especially at the very beginning, I kept lists of words I’d never heard before, and in the breaks I would look them up. I love flash cards used to run through them every chance I got, standing in lines, during staging rehearsals, on the treadmill, etc. But I didn’t look at the English word on the other side—I tried to look at the thing that was named on the card. For example, for “das Fenster”, I would look at the windows. In fact, I found myself doing that at breakfast the other morning out with some American friends—when they asked what “Fruchtaufstrich” was, I started miming spreading jam before I could think of the word in English! Christine: Thank you so much, Ellen, for sharing your insights with us and for regularly being part of GVAI's summer opera program. Please let our readers know how they can find you and The Diction Police. Ellen: Our website is www.dictionpolice.com and you can follow The Diction Police on Facebook, Twitter, Linked In and Instagram @dictionpolice ! Two friends and diction fans: Christine and Ellen in Dresden/Germany. Christine: Congratulations, Brett! You got hired at the Theater Erfurt in Germany! This must be very exciting for you. You received your first Festcontract at a theater in Germany. Brett: THANK YOU! I am very excited for this opportunity! Christine: Many singers dream about getting a Fest contract at a German theater. What was your first reaction when you learned that you got the job? Brett: It was a funny situation, I sang the audition on the stage and after I finished the third aria, the Intendant came up onto the stage and asked me how my German language skills were and if I had any offers for the following season. After we chatted for a bit, he said “If you want it, I have a two year position for you on a Fest contract. What do you think?” I was very excited and surprised (still quite jetlagged, to be honest) and said, “Of course, thank you very much.” We agreed to let them contact my agent about roles and terms. I was so excited but played it cool, I think. As soon as I left the theater, I called my mom and that is when I was overwhelmed with happiness. It was one of those feelings of relief. I knew I would get to stop living out of my suitcase and hustling for every penny. I walked over the Erfurt Weihnachtsmarkt (christmas market) and had a celebratory Glühwein and some food. Then my agent called to discuss the terms and roles. Shortly after, I got on a train to Munich for another audition. Christine: In our previous interview last June, we were already so lucky to learn from the experiences you had during your German audition tour last spring. What happened since then? You told me you received multiple offers. What have you been up to and what are your plans now? Brett: It has been quite the fun Autumn and Winter. I was able to spend two months in Germany for auditions and getting a feel for where I intended to move (before the fest offer came in). I had some very exciting auditions and Arbeitsproben. I received one guest contract offer that fell through at the last moment, but these things happen. My agent was able to secure me a performance of Carmina Burana in Finland which went very well and gave me another opportunity to sing the same piece in Sweden in April. This works nicely, as my rehearsals at Gärtnerplatztheater in Munich begin around the same time. After that production, I will begin rehearsals in Nordhausen for Entführung, before starting my contract in Erfurt. Christine: Singers often ask how many auditions it might take to get a contract at a theater in Germany or until an agency adds you to their roster. How many audition tours did you do before you got hired by a theater and how many auditions did you sing? Where the auditions for specific roles? Brett: I was very fortunate to be added to my agent’s roster very quickly, after auditioning for him once and performing well in house auditions, he organized for me. He runs a week-long workshop in Bavaria called, Bayerische Opernakademie, which is where I met him. He set up a few house auditions for me, some general/informational and a few for specific roles. My second audition in May (specifically for Pedrillo) was the first offer I received, then the next one I took in Munich led to the Gärtnerplatztheater offer. I was very lucky in that regard; my agent has continued to put me in front of many theaters and works very hard on my behalf. I am incredibly grateful for him and his team. 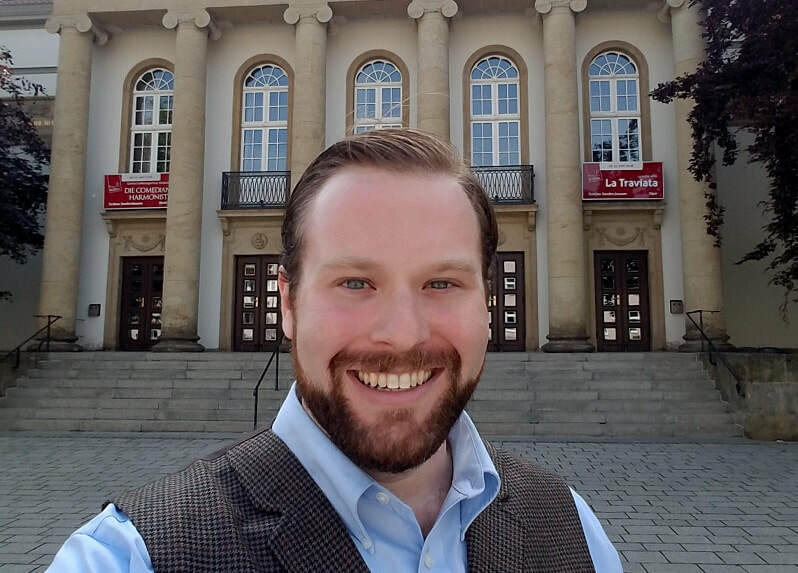 If my counting is correct, I had sung for six different companies for a possible ensemble position before Erfurt hired me. In total, I have gone to Germany four times on audition tours and now I will live there, so it will be easier to audition. Christine: How does the communication with your management work? Did your manager call you in the US telling you that there is an opera audition opportunity next week and you rushed to buy your air ticket? Brett: We talk via email and WhatsApp, usually more in advance than a week. I think my shortest notice was two and half weeks. Then I book my tickets very quickly, so they do not get too expensive. I was in Germany for five days for the Erfurt audition and a showcase set up by the agency for twenty different companies. That was the shortest trip. Christine: How is the work with your management like? What are your and their responsibilities? Were all auditions set up by the agency? Brett: All of my auditions are set up by my management (IOA Management). As I said before, I love my agent and his team. We have an exclusive arrangement, so I only work with this company. He puts me up for anything he thinks is good for me (in Germany and abroad) and schedules the auditions. He always follows up to give me feedback and information regarding the auditions. If an offer is made, he negotiates the terms and takes care of the business. Beyond that, it is on me to do the rest of the work. Without him, I wouldn’t be over there at all, let alone moving. We have a very open, honest, and friendly communication. I am truly lucky to work with him. Christine: Did you change your audition repertoire according to the feedback you and your manager got after the audition? Brett: We always discuss the repertoire beforehand. I have several pieces that I can swap in and out of my audition package and we decide what will be best for the theater and their proposed repertoire. Sometimes I have been asked to learn specific things. For example, I was asked to learn a whole role to coach for an Arbeitsprobe in one theater. That was certainly an interesting seven days of preparation. Christine: You have done many auditions in the US and Germany. Did you learn anything new during the last tour? Brett: ​ I maintain the opinion that the German audition experiences I have had are far better than my​ experience in the USA. First of all, in each audition I have had the opportunity to rehearse with the pianist beforehand, most of the auditions are on the stage of the theaters, and generally the panels have been much more pleasant and respectful. As for tangible differences I have noticed in the process, I would say the German theaters require a more specific product from singers, whereas in the US we are often taught to show we can do a little bit of everything. In my last trip, I definitely got a better idea of what product the business is willing to hire me for, which I think is invaluable. Christine: What did you enjoy most during the audition tour and what where challenges? 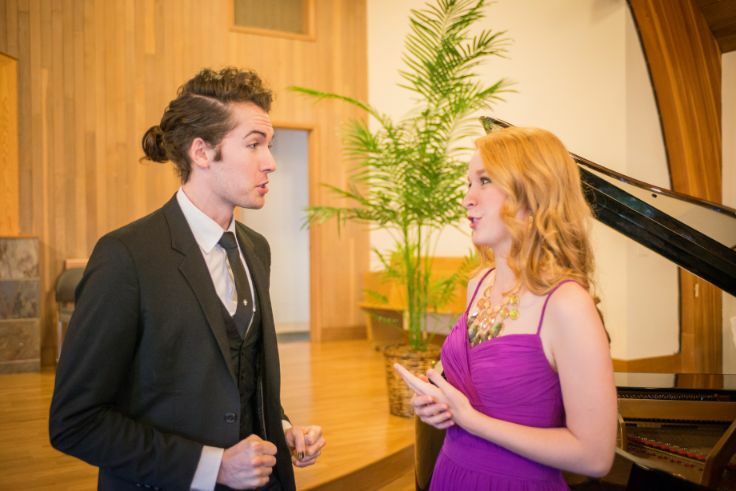 What was your experience singing with different accompanists? Was there a chance to rehearse with them before the audition? Any advice you can give to young singers? Brett: The best part of doing an extended audition tour is traveling to new places and meeting new people! I have made so many friends and seen so many places I may not have seen, had I not been in Germany for two months. I have been to many cultural festivals, Football matches, and spent time experiencing German life. That is the best part to me. The challenge for me was financial. It is hard to have so much money going out and none coming in during a long tour. But, I planned well and had saved quite a bit, so it was ok. As far as singing with multiple collaborative pianists, it is par for the course in the life of an opera singer. I was glad to rehearse with each pianist before every audition, so there was never a messy surprise. Also, I sent my audition list well ahead of time, so they were able to practice before my arrival. My advice to anyone auditioning over there is to be very polite and clear with what you need from a collaborator. They are on your team in an audition situation, so one should treat them as such. Respect and kindness goes a long way. Also, pick repertoire that best showcases you and with which you are comfortable. Christine: What do you think was crucial for you getting hired at a German theater? Brett: Short answer- My agent, knowing my product, a willingness to learn and adapt, and a lot of hard work. Long answer- All of the above short answers plus being patient. Had I gone over there only a few years back, I would not be in the position I am in now. There are more theaters there, yes, but also many, many talented singers. If one is not ready with the right repertoire, a solid technique, and a willingness to learn, they will not find success. Christine: What will your schedule look like? Do you know what roles you will sing? Do you need to pick up shows that are already on their program? Brett: I am sure I will be quite busy in Erfurt, as I am singing five roles over the course of this coming season. However, I am not sure on the dates for everything yet. I am aware of the roles I will be singing, but they are yet to be announced by the theater, so I do not want to announce them just yet. It is possible I could be added to other productions, but I have a negotiated performance cap in the contract. Anything exceeding that total would incur a higher fee. My roles do not all fit into a traditional fach, I am singing things across the tenor spectrum, which I am very excited about. Christine: I am sure that all rehearsals at the theater in Erfurt will be in German. How do you prepare best for this challenge? Brett: I do a lot of German homework on my own to get my brain in the right mode. I know that I will get comfortable the more time I spend in Germany. There is only so much preparation one can do without speaking and operating in the language every day. Christine: How are you planning to make the transition from the US to Germany? What does your family say? Brett: My family is the best! They couldn’t be more supportive. I have family and friends already planning to visit in May, June, and July. I have a few other friends intending to come next year around Christmas. Honestly, I am anxious but very excited. I know it will take some adjusting, but I am willing to do what I need to, in order to find happiness and success. Brett: I get on a plane February 25, start rehearsals March 5, and hit the ground running! I will be back in the USA in late July for my brother’s wedding, then Erfurt rehearsals begin right away. Christine: Thank you so much for your time and willingness to let us be part of your exciting journey! We wish you a great start in Germany and hope that it will turn out as good or even better then you have dreamt of. To learn more about Brett, check out his website . 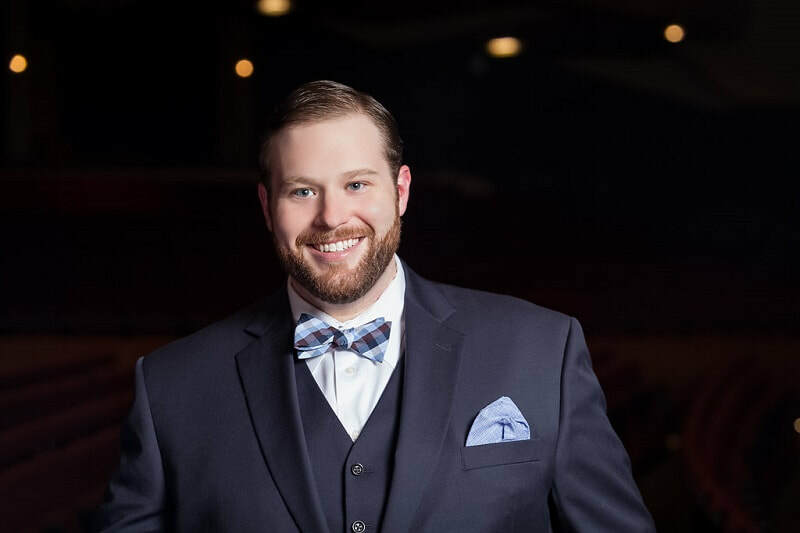 ​American tenor Brett Sprague who recently won first prize of the Seattle Opera Guild Singer's Awards just came back from Germany where he sang for theater auditions. GVAI’s Director Christine conducted this interview with him. Learn and enjoy! GVAI: Thank you Brett, for being willing to share your insights about your tour and your experiences with GVAI's young singers! Brett: It is absolutely my pleasure to share what I learned on my audition tour; it is information I wish I had from someone who recently had the experience. I hope my insights, however limited, can help! The 2018 Classical Singer Convention in Boston - Recap time! 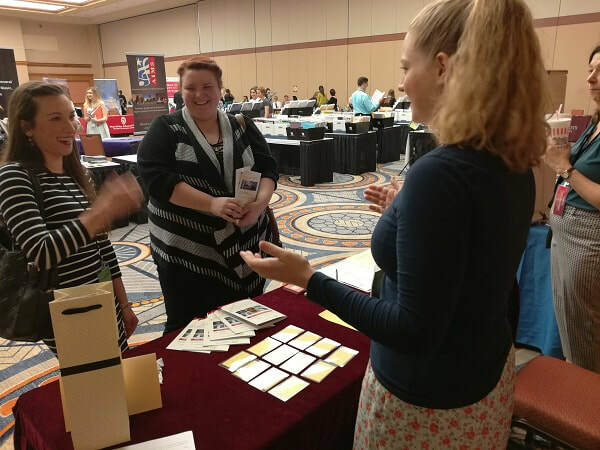 If you were at the Classical Singer Convention in Boston, thank you for stopping by the GVAI table and for attending Christine’s masterclass, “Sing in German.” Christine came back incredibly impressed with the talent she heard at the convention. Congratulations to everyone for participating - it’s hard work to go to and sing at a music convention. All of your preparation and hard work did not go unnoticed! Last year, we talked about how to prepare for your next competition/convention/conference (AKA your CCC!). If you missed it, read it here. Lay out a plan to reach your goal. Following these four steps ensures that you are happy with your participation at your CCC, no matter what the outcome of it. You may not be able control the judges or recruiter’s opinions, but you do have complete control over your preparation. If you have already gone to a CCC and you are considering going again, it is important to determine if it would be a good decision to attend a second time. To determine if it is the right choice, now is a great time to pull out your pros/cons list! Your list might include cost, time spent, connections made, opportunities presented. If you decide to go a second time, it’s important that you will take something away from the experience, just as you did the first time. Now that you have decided to go to your CCC, this year, we’d like to add some steps to your preparation list! These further steps ensure that all of your practical items for your trip are ready.